One of the common problems we encounter in early summer on St. Augustine grass is a leaf spot disease called Gray Leaf Spot. Gray leaf spot develops rapidly with abundant moisture and warm temperatures on St. Augustine grass. It is especially troublesome in shaded areas that remain damp for prolonged periods of time, or in low-lying spots, or where water runoff flows regularly. Under these conditions, the disease can cause serious thinning of the turf. Leaf spots first appear as tiny brown to ash- colored spots with purple to brown margins that enlarge and become elongated or diamond-shaped. Sections of the leaf blade will also turn yellow. In severe cases, lesions develop on stems and spikes and the leaves wither and die. Turfgrass may have a burned or scorched appearance resulting from death or spotting of the leaf blades. 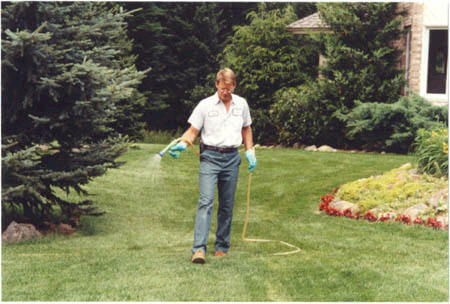 Management: Avoid applying high rates of soluble nitrogen fertilizers on moderately shaded lawns during summer months. Water lawn early in the morning, and only when supplemental water is needed. Avoid evening waterings that keep the leaf surface wet for long periods. Catch and remove grass clippings where gray leaf spot is a problem. Several fungicides are recommended for gray leaf spot control, including azoxystrobin (Heritage), myclobutanil (Spectracide Immunox, Eagle), propiconazole (Fertilome Systemic Fungicide, Ortho Lawn Disease Control, Bannar Maxx), and thiophanate-methyl (Green Light Systemic Fungicide, Ferti-lome Halt Systemic Fungicide, Scotts Lawn Fungus Control, Bonide Bonomyl Turf and Ornamental). Slime Mold. Another weather-related turf phenomenon is called slime mold. You would think by the name we are talking about a slimy, gooey condition on the grass. Actually, slime mold often appears as if ashes or oil was deposited on the grass. Closer examination reveals a granular, crusty or powdery material moving up the blades of grass from the thatch and soil surface. The good news is that slime mold is not harmful to grass, but because it is so visible, it creates concern. Slime mold lives most of its life cycle unseen, breaking down and feeding on organic matter in the thatch and on the surface of the soil. When environmental conditions are just right, it goes from its vegetative state to a reproductive mode. This is when the light colored to dark gray to black spore masses become visible. It moves up any type of support, in this case grass blades, and turns into a large mass of spores that are then blown in the wind and transported in runoff water. The spores easily rub off on your shoes or hand when touched. Besides looking unsightly, slime mold does no harm, and can be washed or swept off the grass. No fungicides are required.